As I work with the two technologies I would like to minimize any code differences I have. Looking at Microsoft, other companies like Telerik (more on them in another post), and CodePlex projects like Caliburn.Micro it seems the evolving best practice is in the title of this post. The best post I found for some of the pitfalls is “Silverlight and WPF code reuse pitfalls” by Morten. Another post that talks more about the strategies for working with both is “Writing WPF/Silverlight compatible code. Table of Contents” by Alan Mendelevich. Note this was based on WPF 3.5 and Silverlight 3 but is still quite valid. I’m going to blatantly copy Alan’s pattern of having a Table of Contents blog post that organizes all the posts related to my efforts to write WPF and Silverlight compatible code. 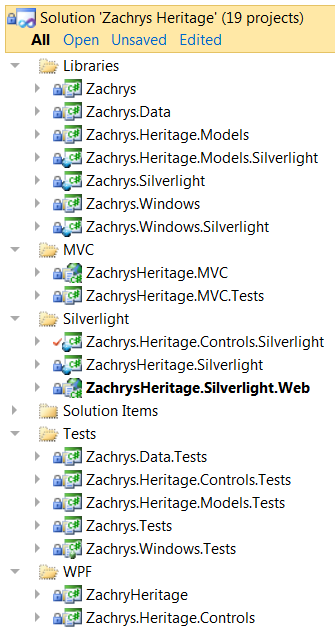 Here are some of the key top level practices I currently have to promote code reuse between Silverlight and WPF. I used Solution Folders to keep track of the different presentation tier approaches as shown here. 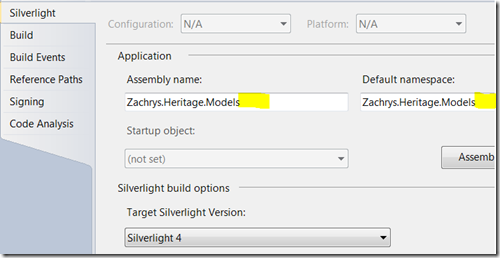 I use the plain namespace for the name of my .NET 4.0 project names and I append .Silverlight on the projects that use Silverlight. However, I use the same namespace for both – which is not the default behavior. This reduces the differences between your .NET and Silverlight codebases. I had lots of code in some libraries that were already in use for an MVC (Model-View-Controller) web application I’d been working on. As a result of that and my testing strategy (see Testing Strategy below) I put the actual files in the .NET libraries and then add a link to them in my Silverlight libraries. I’ll use the Person.cs file as an example. 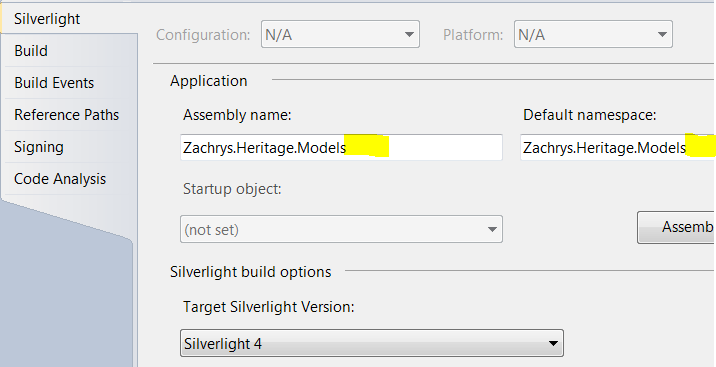 I have a library called Zachrys.Heritage.Models with a Person class. Note the little black arrow that points up toward the upper right. That indicates it is a link to a file in another folder. While there are times where the Preprocessor (compiler) directives (the #if statements) make sense, I try to leverage the partial classes first. The primary objective for making that determination is my code coverage. For now, my testing strategy is to unit test my non-Silverlight code. Since my objective is to have virtually all the code identical, then I will still have great code coverage. The primary reason for this approach is that I have not found a way to run my Silverlight tests on my build server. But I can run my non-Silverlight tests. I think this covers most of the high level project setup items I needed to do. I have other posts on things like making sure you have x86 set in your build definition for TFS, but this post should cover most of the Visual Studio 2010 setup I did. This entry was posted on Sunday, December 5th, 2010 at 1:56 pm and is filed under Technology. You can follow any responses to this entry through the RSS 2.0 feed. You can leave a response, or trackback from your own site. 41 queries in 0.266 seconds.